The Mitsubishi G4 concept car's sheet metal may hint at the look of a future small sedan. Mitsubishi has gaping holes in its lineup and a lot of uncertainty as it looks to revive its waning fortunes in the United States. The company lacks a replacement for the Galant mid-sized sedan, which was phased out last year. The aging Lancer compact sedan is unlikely to see a major update until 2015. But the cupboard isn't bare. The Mirage small hatchback arrives this fall, and a plug-in hybrid version of the redesigned Outlander crossover is expected to arrive stateside next year. A new subcompact sedan is set to launch in 2015. Here's a look at Mitsubishi's product plans through the 2017 model year. i-MiEV: The tiny, egg-shaped electric car is selling the same way it accelerates from 0 to 60 mph: very slowly. No major updates are planned, but the EV is expected to remain in Mitsubishi's lineup. Lancer: Now in its fifth year in its current form, the Lancer is scheduled to receive new sheet metal and a new interior in 2015, likely in the second half, for the 2016 model year. The two-year wait will make a car that already is the oldest in its segment even older, but in a way, it's good news. That's because the high-performance Lancer Evolution is scheduled to remain in production through 2015. Mid-sized sedan: Mitsubishi officials have said the company wants to return to the U.S. auto industry's highest-volume segment. The company has no firm plan to field a new mid-sized sedan, but sources say it's studying options. The trouble is, Mitsubishi's global portfolio lacks a platform architecture suitable for a mid-sized sedan that could be comparable in size to segment stalwarts such as the Toyota Camry or Honda Accord. It may be possible to design a sedan that's bigger than the Lancer on the GS platform, which also underpins the Outlander Sport and Outlander crossovers, but such a car would be smaller than competing family sedans. Mirage: The newest addition to Mitsubishi's U.S. lineup arrives this fall for the 2014 model year. The minicar, roughly the size of the Chevrolet Spark and more than a foot shorter than a Ford Fiesta, gets 40 mpg in combined city and highway fuel economy from its 1.2-liter three-cylinder engine. The hatchback seats five. 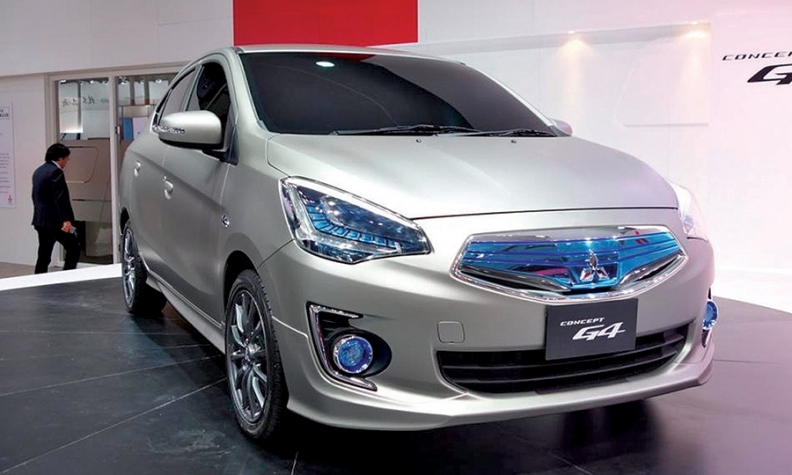 Subcompact sedan: A new small sedan based on the Mirage's platform could arrive in the first half of 2015 for the 2016 model year. The sedan, which should be smaller than the sedan versions of the Kia Rio and Nissan Versa, is expected to have sheet metal similar to Mitsubishi's G4 concept car shown this year at the Bangkok auto show in Thailand. Montero: Mitsubishi wants to revive the Montero nameplate by bringing a redesigned version of the SUV back to the United States in 2016, possibly by midyear. Few details are known about the next-generation Montero. Outlander: A re-engineered Outlander crossover went on sale this year as a 2014 model with new sheet metal and a new interior. A freshening is planned for the second half of 2015 for the 2016 model year. Mitsubishi has committed to bring a plug-in hybrid version of the Outlander to the United States next year, but sources say the launch may slip into early 2015. Outlander Sport: The Outlander Sport's underpowered 1.8-liter four-cylinder is expected to be supplanted with a 2.4-liter four-cylinder on higher trim levels of the crossover for its 2015 model year re-engineering. The compact crossover's continuously variable transmission will also be replaced with a new gearbox. Some exterior design changes to the grille, bumpers and exterior lighting may be in the offing, but those plans are uncertain.